Obama says he will engage Muslim world in "a new way forward"
WASHINGTON (CNN) -- Barack Obama launched his presidency before an estimated 1.5 million people on the National Mall on Tuesday with somber yet confident tones, saying the country will overcome its serious economic and international challenges. 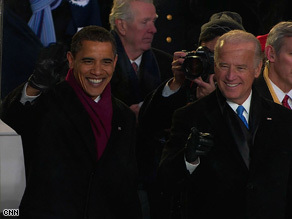 President Barack Obama and Vice President Joe Biden watch the inaugural parade outside the White House. "Today I say to you that the challenges we face are real," Obama said in his inaugural address. "They are serious, and they are many. They will not be met easily or in a short span of time. But know this, America: They will be met." Obama's tempered optimism, however, was bookended by celebration in the Mall and across the country for the inauguration of the country's first African-American president. "This is America happening," said Evadey Minott, a Brooklyn, New York, resident who witnessed the inauguration. Wearing a navy suit and red tie, Obama repeated the oath of office, his hand on the same Bible used in President Abraham Lincoln's first inauguration. Obama thanked those who sacrificed so much so "a man whose father, less than 60 years ago, might not have been served at a local restaurant can now stand before you to take a most sacred oath." "Greatness is never a given. It must be earned," he said. His words resounded with spectators and revelers who let out deafening cheers after his address. Spectator L.J. Caldwell likened Obama to some of the most heroic figures of the civil rights movement. "When you think back, Malcolm [X] fought, then we come a little further. Rosa Parks sat, then come up a little further, and [the Rev. Martin Luther King Jr.] spoke. Then today, President Obama ran and we won," said Caldwell, of Somerset, New Jersey. Celebrations weren't limited to Washington. Across the country, friends and strangers gathered on the streets and in schools, bars and auditoriums to witness Obama's inauguration, united in their hope that he will deliver on his promise of change. In New York's Bronx borough, students huddled in the halls of a school to watch the ceremony on a projection screen. Leaders around the world offered their congratulations. French President Nicolas Sarkozy said the United States expressed "its resolve to have an open, new, strong and caring America." Obama then lunched with lawmakers at the Capitol's Statuary Hall, telling them, "What's happening today is not about me. It is about the American people." Many said before the festivities that they did not have tickets and would be happy to catch a mere glimpse of the nation's first African-American president. Some spectators were more than a mile from the swearing-in ceremony, watching on giant TV screens erected along the National Mall. At St. John's Episcopal Church, where the Obamas kicked off a packed day, 9-year-old Laura Brueggeman waited with her mother, Wendy, and father, Jeff, of Bethesda, Maryland. The affable crowd tried to let shorter onlookers and children to the front for better views. "I want to see Obama. I think that would be really cool. I could tell all of my friends that I got to see him," the youngster said. Security was tight in Washington. However, no arrests related to the inauguration were reported as of Tuesday evening, an FBI spokesman said. The ceremony also drew celebrities like Dustin Hoffman, Denzel Washington and Steven Spielberg. "It's beyond the dream. We're just here feeling it with the throngs of people. It's amazing grace personified," Oprah Winfrey said, sitting next to actor Samuel L. Jackson. As Obama and his wife, Michelle, made their way to the White House, they stepped out of their limousine amid another round of boisterous hoorahs. The first couple beamed as they walked down Pennsylvania Avenue, waving to the throngs kept back by police barriers. They walked a few blocks before returning to their vehicle to finish the two-mile parade that took them to the White House. "I have a sneaky suspicion that Barack and Michelle will be out and about on the streets of Washington [during his term]. ... You'll see them again," said Tracy Miller, who was watching the Obamas. CNN's Jessica Yellin, Jeanne Meserve, Ted Barrett, Ed Hornick, Kristi Keck, Barbara Starr, Scott J. Anderson and Martina Stewart contributed to this report.